Run the World's First Digital Marathon—Hello, London! After I ran my first half-marathon in 2011, I decided right then and there that I was going to run at least one half in every state. So far, I've crossed 10 off my list and love the combination of traveling and racing. It might be cliche, but it's true: you discover so many fun, interesting things about a city when you're running the streets rather than speeding by in a car or on public transit. Unfortunately, I haven't crossed international running adventures off my bucket list quite yet—blame it on the lack of excess money hanging out in my wallet—but thanks to Paofit and the Virgin Money London Marathon, I can get one step closer (pun intended) without breaking the bank, or even leaving my treadmill. Download the Paofit app for free, along with the Digital Virgin Money London Marathon Showcase. If you have a Life Fitness treadmill, plug in your iPad (iPhone and Android versions are coming later this year) to the Track+ or Discover Tablet Console. Once you do, your speed will be accurately recorded and the treadmill will automatically adjust its incline to reflect the course terrain. 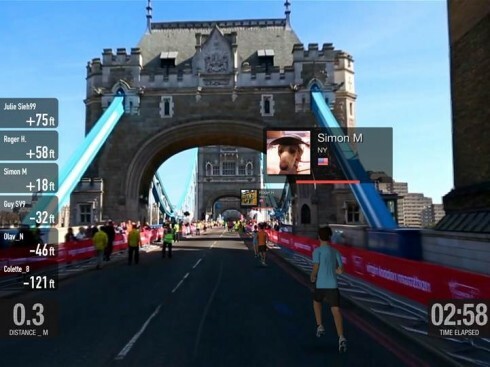 You'll also get to see fellow runners on the course in real-time, so you still get that sense of competition many of us use to keep calm and power on. Don't have a Life Fitness machine? No sweat. Still download the Paofit app and Showcase, and set it on your console. The vibration generated by running on the treadmill will cause the course ahead of you to speed up or slow down to properly reflect your cadence. And if you want even more of a pace guarantee, you can calibrate Paofit to match your stride. Seriously, this may be the coolest treadmill technology I've ever heard of. Not to mention it totally helps familiarize you with the course (hello, Tower Bridge! ), in case you ever do decide to leap over the pond in run the race IRL. 1. We need to chat this out, because I don't understand how this doesn't sound awesome. 2. The Paofit app has eight sample running locales around the world, so you can experiment with other places and purchase locations starting at $1.99. Now, I'm off to go get my own miles in. Let me know in the comments what famous course you'd love to run and maybe we'll meet up to tackle it together.